This morning, The Anthony Wayne Rotary Club hosted its 2nd Annual 5k for Polio. As a Rotarian, I signed up to help with registration and volunteered to bring food. I was assigned cookies and was prepared to head to the store to buy some. Jon would have none of that and insisted on baking some for me. The result? 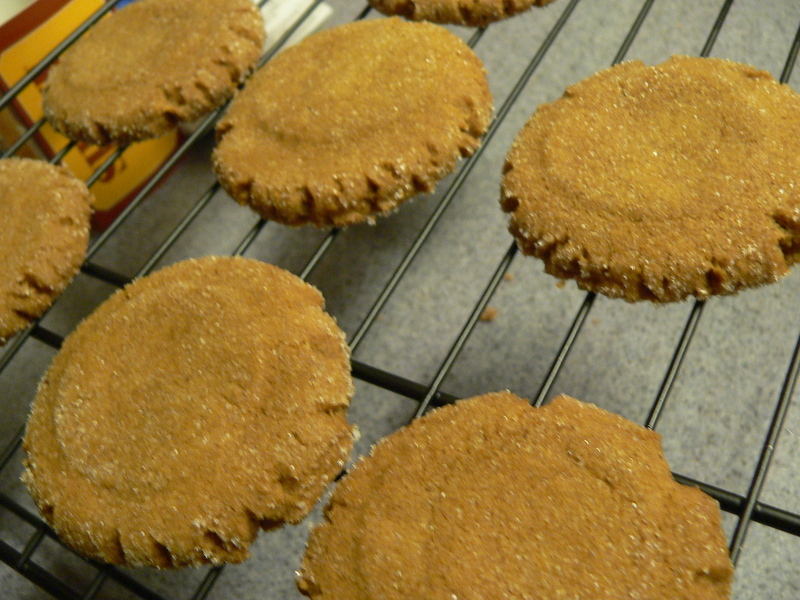 The best Ginger Snaps I’ve ever had. And they were a hit. One older gentleman who had just finished the 5k discovered the cookies amongst the store bought supply and swiftly grabbed 5… he came back 2 or 3 more times. Preheat oven to 325°F. and lightly grease 2 large baking sheets. In a large bowl whisk together flour, salt, baking soda, ginger, cloves, and cinnamon. In another large bowl with an electric mixer beat together butter, shortening, and 3 cups sugar until light and fluffy and beat in molasses. Beat in eggs, 1 at a time, beating well after each addition. Gradually beat in flour mixture and combine well. In a small shallow bowl put remaining 1/2 cup sugar. Form dough into 2-inch balls and roll in sugar. On baking sheets arrange balls about 4 inches apart and flatten slightly with bottom of a glass dipped in sugar. Bake cookies in batches in middle of the oven 15 minutes, or until puffed and golden. (Cookies should be soft.) Transfer cookies with a metal spatula to racks to cool.